Many people choose to downsize to a condo after retirement and their kids leave home and its not without good reason. Condos lend themselves to a hassle free and leisurely lifestyle for you to fully embrace life. Downsizing to a condo means relieving yourself of the burden of outdoor home maintenance. Mowing the lawn and snow removal are things you will no longer worry about, saving you both money and time. Interior home maintenance is also minimized, as a smaller space requires less cleaning and problems with AC units, heaters, plumbing and electrical, as almost all are taken care of by the condo association. With the kids out of the house, it’s time for you and your spouse to enjoy your retirement and travel. Moving into a condo allows you the freedom of leaving your home unattended for long periods of time and not having to worry. With security at the front desk and neighbours so close by can grant you comfort in knowing your suite is being safely monitored while you’re away. With a new home comes a new and exciting neighbourhood to explore, offering a variety of local hotspots just steps from your front door. Condos are built in the heart of up and coming areas, which means you’ll be surrounded by a variety of restaurants, shopping, entertainment and so much more. Another extremely enticing feature of condo living are the luxurious building amenities. 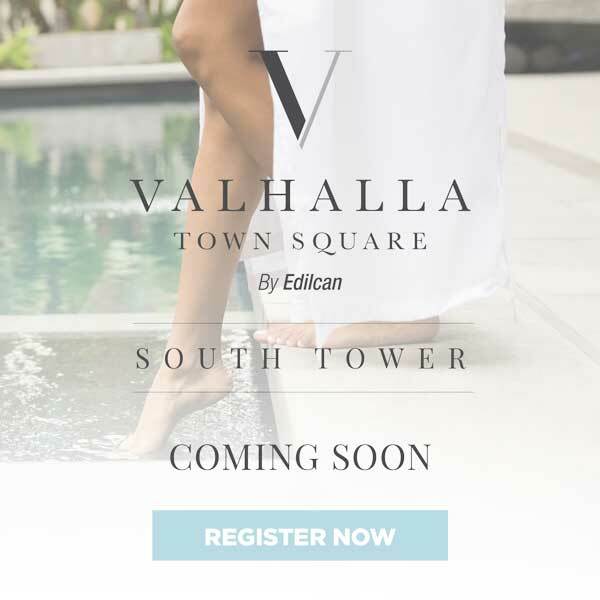 You can enjoy a pool, gym, yoga studio and social room at Valhalla Town Square without being solely responsible for their up keep. Amenities are a wonderful feature for your personal use, as well as the enjoyment of your children and grandchildren when they come to visit.